As the old saying goes, the kitchen is the heart of the home. In the olden days it would be where families would gather to socialise as well as eat, and in modern times the kitchen still retains this decidedly special, ‘homey’ quality. As the heart of the home, it’s therefore important that your kitchen should feel unique to you, and that it’s able to perfectly represent your tastes and preferences whilst still remaining a fully functional, utilitarian space. There can be no better way to achieve this individuality than by installing your own kitchen. Installing a kitchen is a big project, even for an experienced DIY enthusiast. So if you don’t have much experience in this area its best if you take the time to learn before picking up your tools. 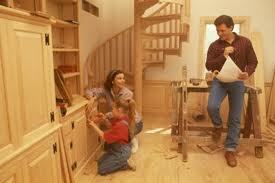 There are many kitchen installation guides which can be watched or read online. Installing cabinets is the easiest part of a kitchen install. The most important part of kitchen cabinet installation is to make sure that your cabinets are all even and on the same level. This can be easily achieved by using a simple spirit level. Make sure to account for any gaps which will be needed for plumbing etc. When you buy units they will usually come with plans – it may be tempting to put these to one side and carry on regardless but this will probably result in your kitchen installation going wrong. Always follow the instructions. Small appliances and plumbing can be installed very easily, but it’s often the case that you will need the right tools to do so. Asking at your local DIY store will help to ensure that you’re working with the right equipment. Which Appliances Should you Not Install? There are a handful of kitchen appliances which no sensible homeowner should try to install themselves. These mostly include larger items, such as gas ovens and washing machines. Not only is it terribly easy to get these types of installation wrong, but it can also be incredibly dangerous in the event of these appliances developing faults. Instead of attempting to connect your own large appliances, you should instead seek out the services of fully qualified, professional installers. Many stores, such as Better Kitchens Limited, have their own team of installers who will carry out installation when your product is delivered. If you’re not buying new, there are plenty of independent installation services to choose from.